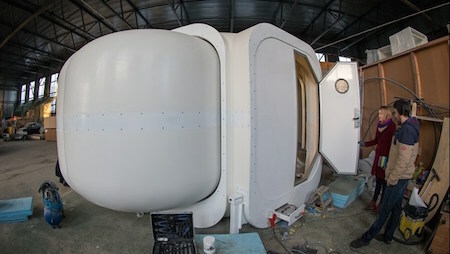 The Self-Deployable Habitat for Extreme Environments (SHEE) is an international project. SHEE was initiated by the Strasbourg-based International Space University (France), the University of Tartu (Estonia) and a few private companies from France, Austria, Belgium and the Czech Republic. Project leader Priit Kull said that the house is a first test, but it is not impossible that an improved version will some day make it to Mars. The current version is likely to be put into more mundane uses. It could prove useful in the disaster areas or function as research bases in extreme environments on earth. SHEE is 2.4 x 6 meters in size when compressed and about twice as large when deployed. It is designed to shelter two people for at least two weeks. "The houses are prefabricated units," said Crawford, "and they sell at the flat rate of five hundred dollars a room — set up. You can trade in your old home on them at a fantastic trade-in value and the credit terms are liberal — much more liberal, I might add, than any sane financing institution would ever countenance. They are heated and air conditioned by a solar plant that tops anything — you hear me, _anything_ — that we have today. There are many other features, but that gives you a rough idea." "They sound like a good idea. We've been talking about low-cost housing for a long time now. Maybe this is it." "They are a good idea," said Crawford. "I would be the last to deny they are. Except that they will ruin the power people. That solar plant supplies it all — heat, light, power. When you buy one of them, you don't need to tie up to an electric outlet. And they will put thousands of carpenters and masons and painters out of work and in the carbohydrates lines, too. They eventually will wreck the lumber industry."